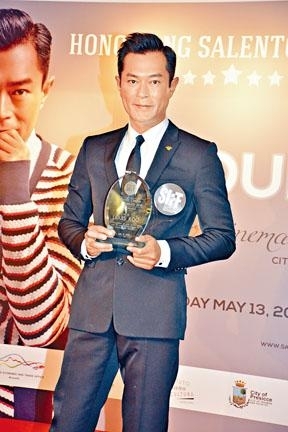 Louis Koo Tin Lok this year with the film PARADOX (SAT POR LONG TAM LONG) won the Hong Kong Film Award Best Actor, the Asian Film Award Best Actor and the Hong Kong Film Directors' Guild Best Actor. Last night Goo Jai at the 7th Hong Kong Salento International Film Festival received the Salento Cinema Actor Award - City of Presicce from the Italian consul general in Hong Kong, Antonello De Riu for his outstanding artistic achievement and film industry contribution. Yesterday was Mother's Day. Would Goo Jai give the award to Mama as a present? Goo Jai said, "That's right, for me and Mama it would be a good present." He said that two nights ago he already celebrated in advanced with Mommy and gave a watch as a gift. Speaking of his friend Leo Ku Ku Ke fell into the center of the stage at the second show of his concert series, Goo Jai revealed that because last night he was Gei Jai's guest he celebrated Mother's Day in advanced. Would he sing POPULAR THIS WEEK? Goo Jai revealed that he and Gei Jai would sing PAST LOVE and that the evening would have other guests. he also asked Gei Jai not to jump too hard after his injury and said that Gei Jai already texted him after the accident. Goo Jai said that last year he injured his neck while working on a science fiction film. It was not as simple as resting. Because the injury involved nerves, hand and neck, the pain lasted for an entire year. The first few nights ago the fall he should immediately apply ice and hope that the nerve would not be infected. Goo Jai said that he promised Gei Jai's wife that he would be a guest long ago, at the time Gei Jai did not know. 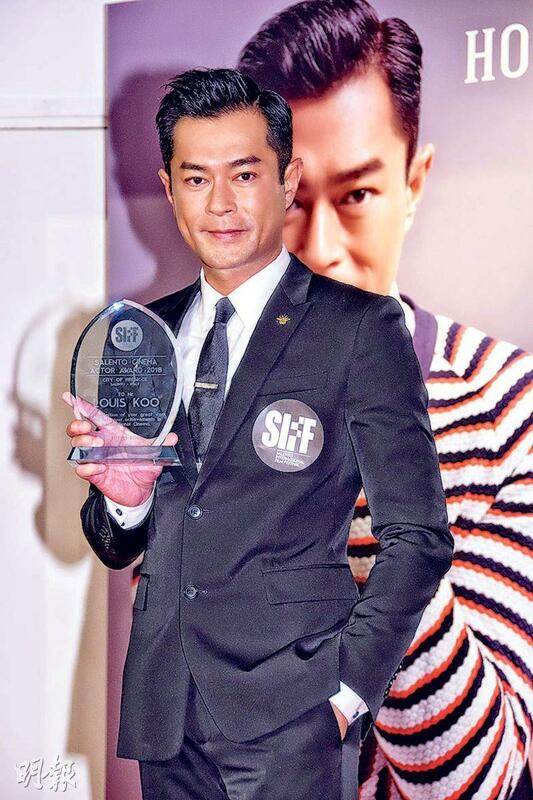 Was he afraid that his appearance would surprise Gei Jai into another fall? Goo Jai said, "Don't be like that." Goo Jai has won many awards this year, would he buy a gift to encourage himself? He said that aside from buying clothes for work he rarely shopped. Now he does not even buy toys as he would wait for others to send them as gifts.